Professor Ugur Kaya is a Turkish ecologist and herpetologist, and a Full Professor at Ege University, one of the top rated academic institutions in the country. 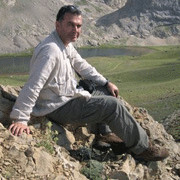 Professor Kaya’s research centers on the ecology, population demography, and conservation of Turkish amphibians, which he has studied since his PhD. He currently is the primary collaborator on an NSF research grant with the Shaffer lab, working on species boundaries in the endangered Turkish salamander genus Lyciasalamandra. These unique animals are geographically restricted to coastal Turkey and several adjacent islands in Greece, and they have been placed in up to 10 very narrowly distributed species on the Lycian coast. In collaboration with UCLA postdoctoral researcher Peter Scott, we are collecting RADseq data on over 150 field-collected samples to redefine species in the group, and use those newly defined taxa as the basic units of conservation in Lyciasalamandra. Ugur is visiting UCLA for two months to complete this project and work with Shaffer and Scott to analyze and write up the resulting data. We welcome Ugur to Los Angeles, the lab, and UCLA. This entry was posted in Uncategorized on October 8, 2017 by Brad.